This entry was posted on May 22, 2017 by Nick. Whatever the occasion or celebration, Hamper.com can help you give the perfect gift. Whether you want to congratulate a friend, thank an important business client or just send a little happiness someone’s way, our luxury hampers are guaranteed to leave a lasting impression. At Hamper.com we have hundreds of food and drink themed gifts available for free UK next day delivery. If your loved ones live abroad, don’t worry, we also have a wide selection of hampers eligible for free worldwide delivery! Browse our full collection of gift hampers online, and take a look at some of our most popular choices from each category below! If you are looking for a thoughtful Father’s Day present this June, Hamper.com has you covered. Our fantastic selection of gift baskets are filled to the brim with craft ales, tasty chocolates, delicious cheeses and fine meats. Discover the full Father’s Day collection online and find the perfect gift for him! Treat the special lady in your life with a gift from the Hampers for Her collection. We have an extensive range of food and drink baskets. Choose from luxury Prosecco and chocolate truffles, tea and cake, vegan snacks and much more! 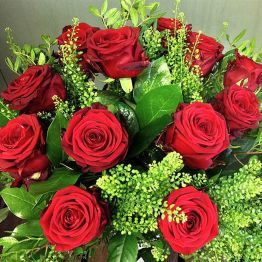 If the recipient isn’t much of a foodie, we also have beautiful flower arrangements available for next day delivery, such as the With Love roses bouquet. Discover our range of luxurious hampers specially selected for men. Each one is filled with tasty treats that are bound to make him smile. Our wide range of hampers for him means that we have the perfect gift! Whether you are buying one for a friend, family member or significant other, show him how much you care with the fantastic Only the Best for Him hamper! What better way to wish someone happy birthday than sending a luxurious hamper straight to their door? Our birthday gift hampers include bottles of bubbly, cakes and birthday themed food to help your loved one get the party started! If you are thinking of treating a beer enthusiast, then a gift basket from Hamper.com is the perfect present. 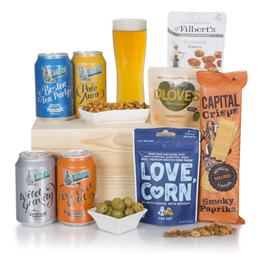 All of our beer hampers and gifts are paired with delicious snacks to complement the flavours. For those partial to pale ale, then our Beer Feast Hamper would go down a treat, whereas the lager lovers may be more suited to the Beers and Bites basket. The wine themed gift baskets from Hamper.com are filled with luxurious tipples from all over the world. Our expert wine buyers have hand selected some of the finest and best quality wines available for next day UK delivery straight to your door. 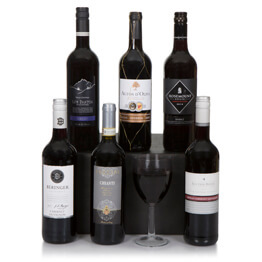 Treat that special someone to a Six Bottle Australian Mixed Wine Gift, for the ultimate indulgence. If you are looking for a present for someone with a sweet tooth, then discover Hamper.com’s luxurious range of Gifts with Chocolate. 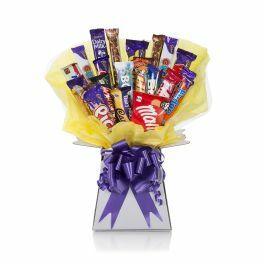 Our handcrafted Large Chocolate Bouquet includes 18 chocolate bars carefully arranged to resemble a bunch of flowers. It is any chocoholic’s dream come true! 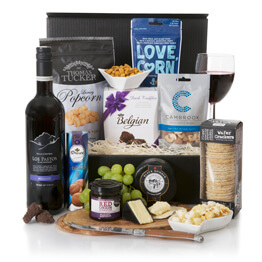 Our selection of Australian Themed Hampers serve as a great present from down under. If you are living in Australia, send your loved ones a fabulous gift filled with fine Aussie wine and traditional snacks such as Tim Tams and Violet Crumble. Explore Hamper.com’s full range of food themed gifts available online. From fine cheeses to smoked meats, nuts, crisps and speciality foods, we have it all! Browse the collection and discover the perfect delicious food selections available for next day UK delivery. If you can’t find the gift hamper you were looking for, why not create your own? Fill a custom basket with goodies you know they will appreciate! If your loved one lives abroad, take a look at our luxurious collection of international hampers. We also have a wide range of gifts available for worldwide express delivery!